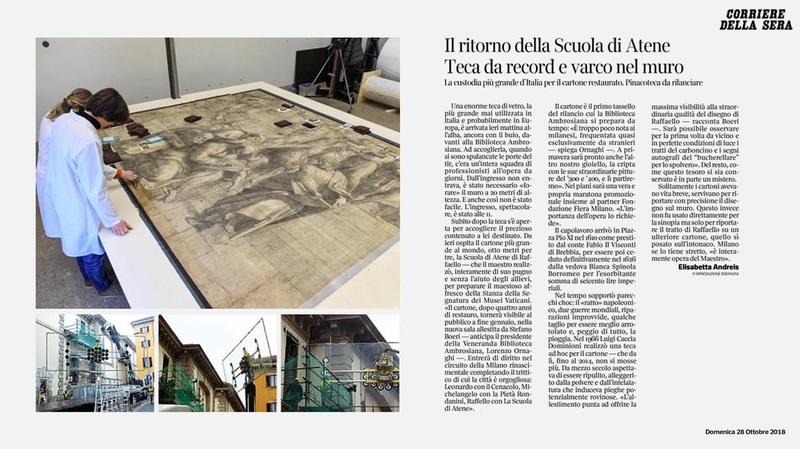 The biggest shrine ever built in Italy for a restoration opens a hole on the walls of the Veneranda Biblioteca Ambrosiana where, since yesterday, has been placed the biggest preparatory drawing from the Renaissance that exists, the one done by Raffaello Sanzio for The School of Athens. A priceless artwork that required a new set-up to be observed; the project has been assigned to Stefano Boeri Architetti and yesterday got the first step completed. The biggest case that was ever realized in Italy, designed in its previous version in 1965 by Luigi Caccia Dominioni, has been lifted and brought inside the building. The 8×3 meters drawing was completely drawn by Raffaello Sanzio, without the help of his pupils, to prepare the majestic fresco of the Vatican Museums. «The drawing, after four years of restoration, will be visible to the public at the end of January, in the new room designed by Stefano Boeri – Lorenzo Ornaghi, the President of the renowned Library, anticipates. Since it will complete the triptyque along with Leonardo’s Cenacolo and Michelangelo’s Pietà, it will authomatically be part of the Milan of the Renaissance that makes the city so proud».